Ko te mahi nui a ngā pūkenga matua ā-ipurangi ko te tautoko i ngā kaiwhakahaere me ngā pouako ki te whakataki, ki te whakawhanake hoki i tō rātou māramatanga ki te hira nui o aua pūkenga matua mō ngā ākonga. Supporting school leaders and teachers as they introduce and deepen their understanding of key competencies for learners. These papers were developed to make clear the evidence base and intent of the key competencies, and provide a view of current practice to help inform discussions at key education events in 2018. The key competencies and effective pedagogy project undertaken by NZCER and University of Waikato helps schools audit their progress with integrating the five key competencies into all learning programmes. Example units and lessons are included. Key competencies are the capabilities people have, and need to develop, to live and learn today and in the future. Key competencies encompass knowledge, skills, attitudes, and values. Key competencies work together and influence each other. Key competencies require teachers to notice not just what students are learning, but how they are learning and their capacity to continue learning. Key competencies are demonstrated in performance – they require action. Key competencies are complex and changing – they will look different in different contexts, and will be developed through opportunities to use them in increasingly wide-ranging and complex contexts. Key competencies require teachers and learners to think about dispositions (tendencies or inclinations) to consider if students are ready and willing, as well as able, to learn. Key competencies strengthen students’ capacity to participate in the world right now, rather than just prepare them to participate in the world at some time in the future. Key competencies are not just a new name for the essential skills – they include skills, but also emphasise how skills relate to knowledge, attitudes, and values, and how skills can be used in interactions with others in various contexts. Key competencies are not just for young people – students, teachers, leaders, parents, community members are all both teachers and learners. 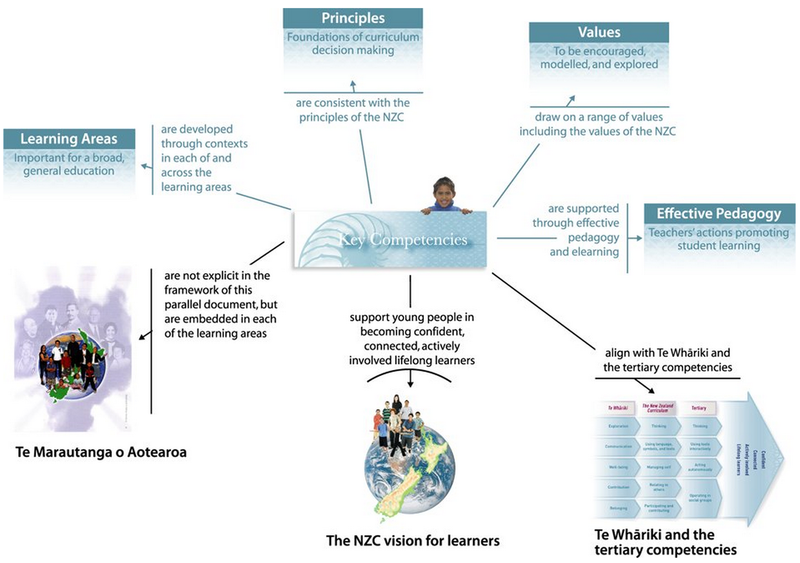 Key competencies are aligned to the principles of the New Zealand Curriculum. 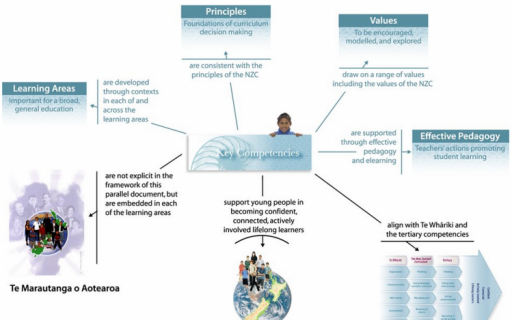 The key competencies draw on a range of values including the values of the New Zealand Curriculum. 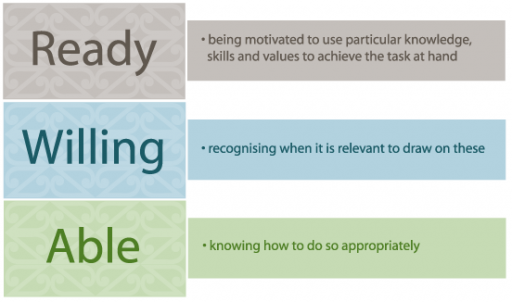 Key competencies support young people in becoming confident, connected, actively involved, lifelong learners as described in the New Zealand Curriculum vision. Key competencies should be embedded in learning in each of the learning areas. Key competencies are supported by effective pedagogy. Why do key competencies matter? The key competencies take account of the vast changes in society, work, knowledge, and technology that have occurred since education systems were established. Key competencies matter because things have changed. Since our education systems were first established there has been enormous change in the nature of societies, change in the nature of work, change in how knowledge is viewed, and change in technologies, to name just a few. Those changes, and the certainty of ongoing change, have implications for the kind of education our young people require, and the focus of the teaching and learning they experience. The key competencies take account of those changes – they put today’s students at the centre, and bring a future-focused perspective to teaching and learning. It is no longer sufficient for students to merely acquire knowledge and master skills. Students need opportunities to develop their capability as users of knowledge and skills in wide-ranging contexts now and in the future. This requires attention not only to their recall of knowledge, or ability to perform particular skills, young people need to be capable at thinking, using language, symbols and texts, managing self, relating to others, and participating and contributing. They also need to be capable of using those competencies in diverse contexts – at school, in the community, at home, with friends, with peers, in mathematics and statistics, in the arts, and other learning areas. They need to be both able, and inclined, to draw on knowledge, skills, attitudes, and values simultaneously as they interact with others in their learning and in all aspects of their lives.